Ballsports have of course been played for a very long time and myth has it that even the Olmecs (1200-400 BC) played ball in closed courts. In Tenochtitlan the ball court was reputedly a scene of brutality as the losing coach (or whole team) was sacrificed. The odds today are different of course, but still very high as the football ecosystem generates global revenues of over 25 billion dollars annually. It is estimated the European Champions League final will be broadcast to more than 200 countries for an audience of 380 million viewers (US Superball is about 120 million) with over $108 million in prize money for that game alone. High stakes for a game where the competition is so fierce that only small details will decide who wins – or not. The media and audience are of course focalising their attention and interest on the two teams that participate in such games where the major players gather most of the limelight. These players are today huge stars and celebrities in their own right, with their own brands of sportswear, fitness-programs and celebrity partners. Mostly we attribute the success and failure in these major games to the achievements of the athletes that make the headlines in these epic duels that oppose stars and their respective teams. A mostly overseen element in these fierce battles is the man in black… The referee truly has the faith and outcome of the game in their hands but we most often willingly ignore them as we let the show go on for the pleasure of entertainment or ‘the beauty of the game’. Blowing the whistle in high profile soccer games is for obvious reasons not left to chance, and while referees publicly can be recognised they are never really held as responsible for making conscious choices or being the most important element of the elaborate stagecraft put before us. It is however difficult to argue to the contrary when analysing the factual impact of the referees decisions, only we mostly want to keep the illusion of a fair game alive and let the referees blow their whistle according to plan – if there is a plan of course. To have such hidden power in one’s hand is not trivial. A referee is therefore not a position that can be left in the hand of the uninitiated, and it surely isn’t. It is most probably only Elite individuals that qualify for these positions and part of the disguise will be to make us believe the contrary – that the referees have worked their way up from nowhere (anybody can be President) and haul from a normal social background often with some insignificant obscure work occupancy in their past : public education, State or law enforcement. By applying the gender agenda to each and every field, the Elite do make their presence a bit harder to ignore. By introducing the ‘first’ female referee in professional soccer it is difficult not to look closer and blow the EGI whistle. 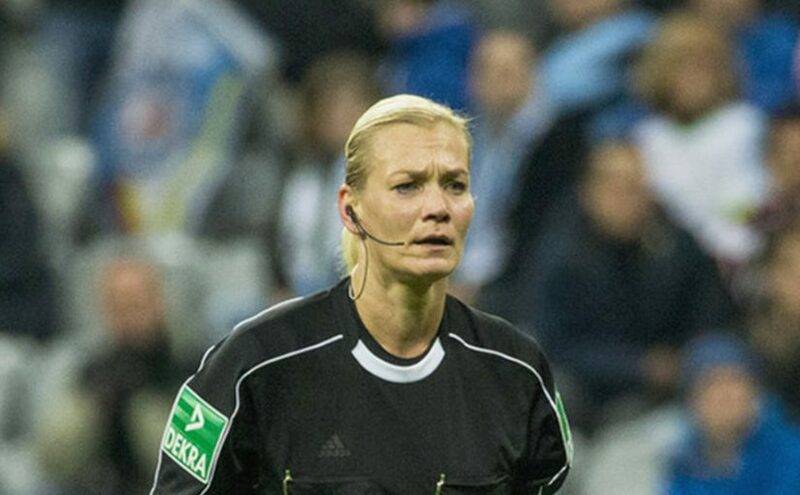 The first female referee in European professional soccer league history is Bibiana Steinhaus and quite possibly an Elite Gender Inverted individual. Not only is ‘Bee Bee Ana‘ suspect by herself, she comes gift-wrapped married to Howard Webb, a retired FIFA international referee from 2005 to 2014. Coincidentally, both are trained police officers – and Howard is additionally part of British nobility since 2011 (MBE).